A few weeks back I received a package that made me feel like Princess Mia Thermopolis, Her Royal Highness from The Princess Diaries. Why would that be? Joolwe.com sent me a couple of their lovely silver jewelry pieces to wear and review. It has been at least 4 years since anyone (um...hum) has seen fit to purchase jewelry for me, so this was a royal treat. Joolwe.com, a new online jewelry store, specializes in providing classic and trendy necklaces, pendants, bracelets, earrings and rings at affordable prices. They offer a large selection of pieces in many different designs with varying gemstone and metal choices, including Cubic Zirconia and Silver Jewelry store selections. 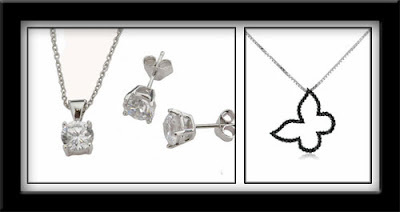 Joolwe.com keeps you up-to-date with the latest jewelry news in their Jewelry Blog. Pictured above are the two necklaces and the earring set I received from Joolwe.com. The classic Sterling Silver CZ Solitaire Pendant & CZ Stud Earring Combo pretty much goes with anything. The simple yet elegant CZ Silver Pendant style suits me pretty well. The large Cubic Zirconia stone sparkles even more brilliantly than my real diamond wedding ring. The CZ Silver Earrings perfectly match the necklace. As soon as I opened the package containing the Black Cubic Zirconia Sterling Silver Butterfly Pendant, my preschool daughter was all a flutter with excitement. She kept saying she wished she had a pretty necklace like mommy. The black CZ stones actually sparkle more than pictured and the necklace with its black/silver contrast is quite striking. Take a look at Joolwe.com. You may find the perfect gift to give Mom this Mother's Day! They offer free shipping on all orders. I know my mom would really like this Heart necklace showcasing synthetic ruby and diamond accents. Thanks to Family Review Network and Joolwe.com for this review opportunity!